A figure of Gerry Adams was hung from a makeshift gallows on a loyalist bonfire in County Antrim before being set alight last night, Friday, 11th July. 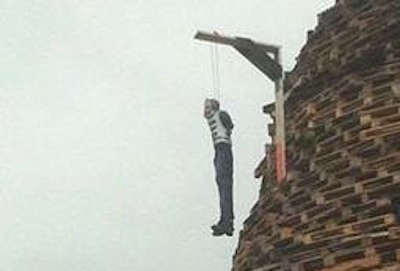 The effigy of Mr Adams wearing a Celtic jersey appeared at the top of a bonfire in the loyalist Ballycraigy estate in Antrim town in recent days. It was one of hundreds set ablaze across the North last night to mark the eve of the ‘Twelfth’, when the Protestant Orange Order marches across the Six Counties to mark the anniversary of the Battle of the Boyne in 1690. The Sinn Fein leader has become the focus of unionist anger in recent months after he was accused by DUP leader Peter Robinson of having a ‘negative’ influence in Six-County politics. Mr Adams described the development as “deeply offensive and a clear hate crime”. Racist and sectarian placards referring to “cotton picking n****s” and “taigs” [Catholics] were also placed on the same bonfire. In east Belfast, a racist sign about Hong Kong-born South Belfast MLA Anna Lo was placed on a bonfire there. Several of Ms Lo’s election posters were placed on the bonfire beside a placard saying “Anna Lo ate my dog”. Ms Lo also described the development as a hate crime and called on the PSNI to take action. She questioned why public funds are paid to loyalist paramilitary groups to fund such bonfires. “These people need to be very careful,” she said. “A lot of these bonfires have support from local councils and the Office of the First Minister and Deputy First Minister and if that’s the case they would be in breach of the grant conditions of maintaining good relations and will be asked to refund the grant money,” she said. “I would imagine they have chosen the posters displayed because Anna Lo has a stance for a united Ireland and she is from an ethnic minority and that’s racism. I am a Catholic living in north Belfast who ran as an independent. A number of Irish national flags were also placed on bonfires, some daubed with the sectarian ‘KAT’ (Kill All Taigs) slogan. Most had posters of Sinn Fein, eirigi or other nationalist candidates placed on them. A statue of the Virgin Mary which was ripped from a memorial in west Belfast appeared in a photograph atop the giant Lanark Way bonfire. The giant structure in west Belfast had reached 80ft high and appeared to be dangerously unstable. And once again, an illegal bonfire was built close to the entrance of one of the North’s biggest hospitals Wooden pellets stacked more than 30ft high were still being added to the bonfire on the Donegall Road in Belfast yesterday, only yards from Belfast City hospital. In previous years there has been severe criticism of the structure after it toppled over onto the Donegall road. The intimidating nature of the bonfire for hospital staff, patients and visitors has also been an issue and was raised by former SDLP Assembly member Carmel Hanna five years ago. She said people were “too afraid” to make complaints. Ms Hanna’s name was placed in front of the bonfire after she went on record to oppose it.